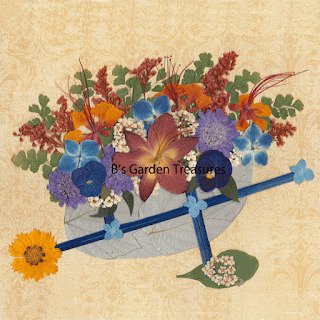 I recently finished this original (#140-Wheelbarrow) which features lily, pansy, hibiscus, bird of paradise, bridal wreath, solidago and pincushion in the wheelbarrow. The wheelbarrow itself was created from blackberry leaves and straw. The front wheel is made with coreopsis. The framed and matted original is currently available (Oct 22, 2012). This image can also be purchased as a digital print.